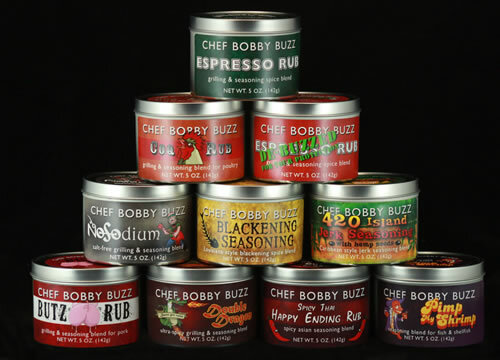 Inside each container of Chef Bobby Buzz Spice Rubs, you will find one man's notion of what tastes good. There are no focus groups and no corporate control, just the desire to make food taste great. Try Chef Bobby Buzz Rubs on any grilled, broiled, sauteed, seared or baked meat, fish, seafood or vegetable. The rich taste of imported herbs and spices adds to the flavor of all your favorite foods. If you don't like our products for any reason return the unused portion and we will refund your money including shipping costs. Your satisfaction is guaranteed. Go to our Specials page to order! Contact us at info@chefbobbybuzz.com for discounts on multiple orders.